A short biography of French anarchist, Paris Communard, and national hero at the time, Louise Michel. On 14th July 1870, war broke out between France and Germany. Paris was besieged by the Prussian armies. It was during this time that Louise Michel was arrested for the first time. She had, along with Mme Andre Leo, managed to organise a group of volunteers to go to aid Strasbourg in one last stand against the Prussian armies. They were arrested at the Hotel de Ville, which was the building occupied by the acting government. They were arrested as they insisted on receiving arms. On 27th September, she was released, but Strasbourg had just fallen to the Prussians. Despite this, she remained active and optimistic. She was president of Montmartre Women's Vigilance Committee. Their aim was to provide shelter and food for all who needed it. In December, she was arrested again. She was accused of organising a demonstration in front of the Hotel de Ville. She replied by saying "I couldn't have organised any demonstration to speak to the government, because I no longer recognised that government". In January 1871, Paris surrendered to the Prussians. The French were allowed to elect a new government. This government held a large majority of monarchists, who were planning to overthrow the national guard and to arrest republicans. They failed, as the people opposed them, and fled to Versailles. On 18th March 1871, the people of Paris reclaimed their city, for the people. They set up an independent 'commune', with the people themselves - rather than a corrupt, bourgeois government - controlling the destiny of the city. This became known as the Paris Commune. It was a social revolution, which tried to create freedom and equality for all the people of Paris. Louise Michel, like many others, gave her total self to the revolution. She fought on the barricades, devoting herself to the cause. She was eagerly willing to sacrifice her life for the "conquest of freedom". In her memoirs, she describes the struggle: "In my mind I feel the soft darkness of a spring night. It is May 1871, and I see the red reflection of flames. It is Paris afire. That fire is a dawn". 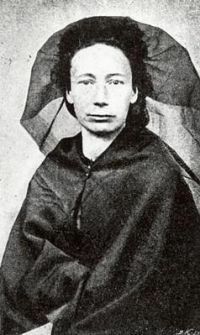 After the fall of the Commune, Louise Michel had to turn herself into the authorities, as they threatened to shoot her mother. She was marched, along with other prisoners who were active in the commune, from Versailles to Satory. Along the way some were woken in the middle of the night, made dig their own graves and then shot. In total, there were about thirty thousand men, women and children executed. 3. Possession and use of weapons, and wearing a military uniform. 7. Illegal arrests, torturing and killing. "I do not wish to defend myself, I do not wish to be defended. I belong completely to the social responsibility for all my actions. I accept it completely and without reservations. I wished to oppose the invader from Versailles with a barrier of flames. I had no accomplices in this action. I acted on my own initiative. I am told that I am an accomplice of the Commune. Certainly, yes, since the Commune wanted more than anything else the social revolution, and since the social revolution is the dearest of my desires . . . the Commune, which by the way had nothing to do with murders and arson.
. . . since it seems that any heart which beats for freedom has the right only to a lump of lead, I too claim my share. If you let me live, I shall never stop crying for revenge and l shall avenge my brothers. I have finished. If you are not cowards, kill me!" Louise Michel was sentenced to lifetime deportation. On 8th August 1873 she began her voyage to New Caledonia. It was during this journey that she met Natalie Lemel, who was responsible for introducing her to anarchism. The conditions in New Caledonia were harsh. There was a serious food shortage and very little medical care. After spending five years in exile, she was allowed to teach the Kanaks, and the children of colonists. She got to know and respect the Kanaks, the indigenous people. Her support for their struggles against French invasion and racism is remembered today in the capital city, Noumea, where there is a museum dedicated to anarchism. The French Government finally consented to an amnesty for the prisoners of the Paris Commune. In 1880, after six and a half years in exile, Louise Michel began her long journey home. On 21st November, she spoke at her first public meeting in Paris. Her speeches were inspirational and effective. "It is the people who will deliver us from the men who have been corrupting us, and the people themselves will win their liberty." During this time, she wrote many articles on the effects of strikes. When the prisoners who were exiled returned, many of them were out of work and starving. Michel put a lot of work and energy into trying to set up a soup kitchen to feed these people. In January 1882, Louise Michel was arrested again. She was charged with insulting policemen. Even though this was a lie, she was still sentenced to two weeks in prison. After her release, Michel gave lectures in countries throughout Europe. At all times her movements were being watched by policemen, while she travelled from Belgium to Holland and to England. On her return home, she continued touring through France raising money for women spinners in Lille, who were on strike. On 9th January 1883, in Lyon, sixty-eight anarchists were brought to trial. These included Peter Kropotkin, Emile Gautier, Bordat and Bernard. They wrote a document called "The manifesto of the Anarchists". In it they describe what anarchy is, and what anarchists want. "We claim bread for all, knowledge for all, work for all, independence and justice for all." Kropotkin and the others were sentenced to five years' imprisonment. On 9th March 1883, at the Esplanade of Les Invalides, there was a large demonstration. Afterwards, a large number of people marched across Paris. Leading this procession was Louise Michel. There were three incidents of loaves of bread being looted from bakers' shops. After going into hiding for three weeks, she turned herself in. She was charged with having been one of "the leaders and instigators of looting committed by a band". Louise was condemned to six years of solitary confinement, and ten years of police supervision. She describes this incident in her memoirs: "It is not a question of breadcrumbs. What is at stake is the harvest of an entire world, a harvest necessary to the whole future human race, one without exploiters and without exploited". During her time in prison, she continuously wrote to the authorities. She asked to be moved nearer her sick mother in Paris. Eventually, the authorities permitted her to be moved to Paris, and attend her dying mother's bedside in her last few living days. Her mother's death was a severe blow. In the following January she was pardoned and freed from prison. Two years later, as Michel was giving a speech, she was shot behind her left ear. When her would-be assassin was on trial, Michel defended him. She said, "he was misled by an evil society". In the last few years of her life, she toured extensively around France, promoting anarchism. After returning from a trip to Algeria, she fell seriously ill in Marseilles - partly due to the bullet remaining lodged in her skull. Louise Michel died on 9th January 1905. Having been for much of her life, a national anti-hero - loved and loathed in equal measure, her funeral was a large occasion, with red flags and two thousand mourners. There were memorial services for her all over France, and in London. She spent her life fighting against the injustices of society., she had sacrificed herself and had passionately given her all to the revolution. "We revolutionaries aren't just chasing a scarlet flag. What we pursue is an awakening of liberty, old or new. It is the ancient Communes of France, it is 1703; it is June 1848; it is 1871. Most especially it is the next revolution which is advancing under this dawn". The little girl who used to sit by the fire and listen to her grandfather's stories of the heroes of old, had now herself become a legend.